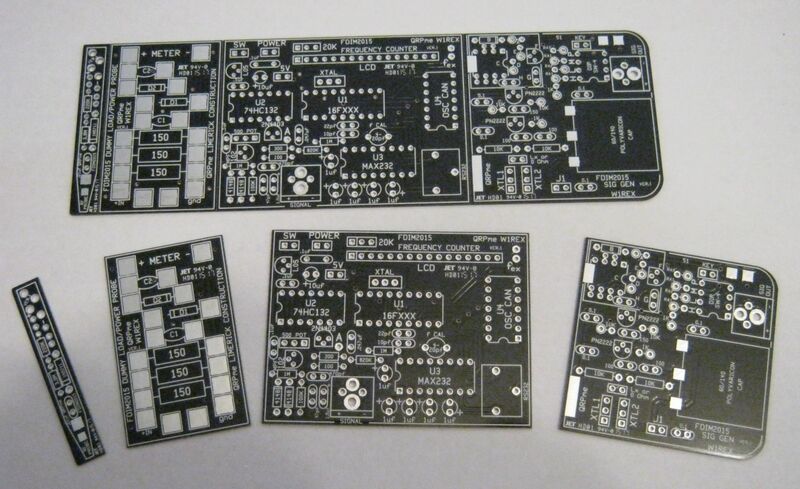 Unfortunately, due to a glitch in my 'Just in Time' parts ordering routine, I can no longer offer a kit to YOUR QTH in time to build along with us at the BUILDATHON. I'm pretty sure that I CAN fill the orders that have already been booked. I will have more polyvaricons delivered to me at FDIM as MY existing stock is gone. I will have plenty of kits available after I get home from Dayton. I've kitted quite a few and all I have to do is add the caps to the orders before shipping. This year, the Buildathon kit will actually be 4 projects in one! Ambitious...YES! The 4 small projects are themed around the essential tools you need when working with a kit under construction or troubleshooting on your home bench. A simple and compact RF probe for checking RF voltages in a QRP project using your DVM. A dummy load with RF power measurement circuitry. A multi-band crystal controlled signal generator for testing QRP receivers etc. A simple RF frequency counter for measuring QRP oscillator circuits. Kits will be mailed at the end of April so that they will arrive in time to build along with us.